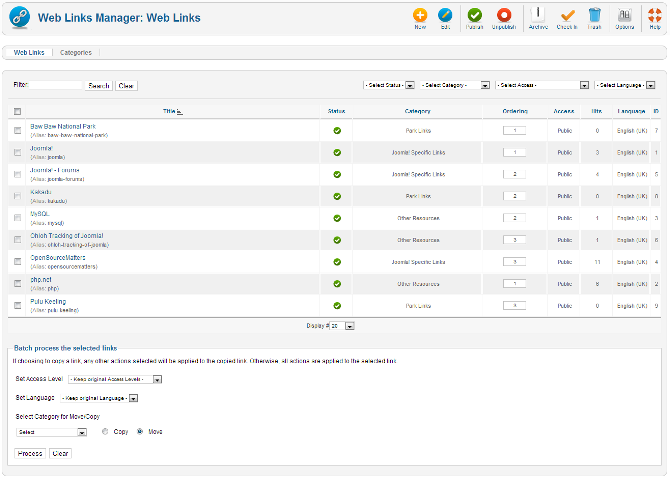 The Web Links Manager allows you to manage links to other web sites and organize them into categories. Select Components → Weblinks → Links from the drop-down menu of the Joomla! Administrator Panel, or select the "Links" link on the Web Links Category Manager screen. The Web Links Manager allows you to add, edit and remove links to other web sites on your Joomla! web site, and organize them into categories. You can then display these links on your site, and optionally let visitors add new links. Category. The Category this item belongs to. See Web Links Category Manager - Edit. Ordering. The order in which to display items. You can sort the list by order number by clicking on the Ordering label in the column heading. If the list is sorted by this column, you can change the order by clicking the arrows or by entering the sequential order and clicking the 'Save Order' icon. This is shown in the screen below. Note that the ordering is only defined within a single category. For this reason, it is easier to re-order the list if you use the Category filter to select one category. Access. The viewing level access for this item. You can filter the list of items by typing part of the weblinks name or the ID number of the weblink. The selections may be combined. Only items matching all selections will be displayed in the list. Archived: Shows only items that are Archived. Filter by Category. Lets you show only items assigned to a specific category. The list box will show the categories defined for your site, similar to the example below. Filter by Viewing Access Level. Lets you show only items that have a specified viewing access level. The list box will show the access levels defined for your site, similar to the example below. <your access level>: Show items only with this viewing access level. Page Controls. When the number of items is more than one page, you will see a page control bar as shown below. Display #: Select the number of items to show on one page. New. Opens the editing screen to create a new web link. Edit. Opens the editing screen for the selected web link. If more than one web link is selected (where applicable), only the first web link will be opened. The editing screen can also be opened by clicking on the Title or Name of the web link. Publish. Makes the selected web link available to visitors to your website. Unpublish. Makes the selected web links unavailable to visitors to your website. Archive. Changes the status of the selected web links to indicate that they are archived. Archived web links can be moved back to the published or unpublished state by selecting "Archived" in the Select Status filter and changing the status of the web links to Published or Unpublished as preferred. Check In. Checks-in the selected web links. Works with one or multiple web links selected. Trash. Changes the status of the selected web links to indicate that they are trashed. Trashed web links can still be recovered by selecting "Trashed" in the Select Status filter and changing the status of the web links to Published or Unpublished as preferred. To permanently delete trashed web links, select "Trashed" in the Select Status filter, select the web links to be permanently deleted, then click the Empty Trash toolbar icon. Options. Opens the Options window where settings such as default parameters or permissions can be edited. Web Links. This link is disabled, since we are already in the Web Links page. Categories. Click this link to go to the Web Links Category Manager page. 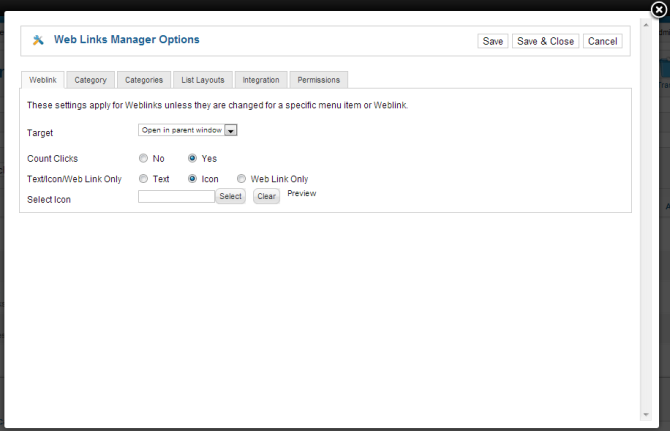 Click the Options button to open the Web Links Manager Options window which lets you configure this component. Note: Many of the options specified here can be overridden for each List All Web Link Categories and List Web Links in a Category menu items or in each individual Web Link item. Save. Saves the weblink options and stays in the current screen. Save & Close. Saves the weblink options and closes the current screen. Target. (Open in Parent Window/Open in New Window/Open in Popup/Modal) Choose what type of window to open the weblink in. Count Clicks. (Yes/No) Whether to count how many times the weblink has been clicked on. Text/Icon/Weblink Only. (Text/Icon/Weblink Only) Choose whether to display a text, an icon or nothing with the weblinks. Select Icon. The Icon to be displayed to the left of the Weblinks URL. Select an image file from the drop-down list box. The images are listed from the 'images/M_images' folder. These settings apply to menu items of type List All Web Link Categories and List Web Links in a Category, unless they are overridden in the menu item's Category options. Choose a layout. Choose an alternative layout for the single weblink category view. Category Title. (Show/Hide) Show or Hide the category Title. Category Description. (Show/Hide) Show or hide the description of the category. Subcategory Levels. (All/1-5) The number of levels of subcategories to show in the layout. Select All to show all levels in the subcategory hierarchy. Empty Categories. (Show/Hide) Whether to hide or show the categories that contain no content items or subcategories. Subcategories Descriptions. (Show/Hide) Whether to hide or show the category description of subcategories. # Web links. (Show/Hide) Hide or Show the number of Web Links in each category. These settings apply to menu items of type List All Web Link Categories, unless they are overridden in the menu item's Categories options. Top Level Category Description. (Show/Hide) Show or Hide the top category description. Display Select: (Show/Hide) Can Show or Hide the Select dropdown listbox. Table Headings: (Show/Hide) Can Show or Hide the headings in list layouts. Links description. (Show/Hide) Hide or Show the Link Description for each Web Link. Hits. (Show/Hide) Hide or Show the number of hits for each Web Link. Pagination: Can Show or Hide Pagination Options. Pagination allows additional content to be displayed on subsequent pages. This may be useful if your content will not easily fit on one page. Pagination Results: Can show the number of pages of newsfeed content. This option is only viewed if the Pagination option is turned on. An example would be Page 1 of 4. Show Feed Link. (Show/Hide) Show or hide a RSS feed link. You work on one Group at a time by opening the slider for that group. You change the permissions in the Select New Settings drop-down list boxes. The options for each value are Inherited, Allowed, or Denied. The Calculated Setting column shows you the setting in effect. It is either Not Allowed (the default), Allowed, or Denied. Note that the Calculated Setting column is not updated until you press the Save button in the toolbar. To check that the settings are what you want, press the Save button and check the Calculated Settings column. Change an weblinks state (Publish, Unpublish, Archive, and Trash) in the component. Edit existing weblinks in the component that the logged in user has created. There are two very important points to understand from this screen. The first is to see how the permissions can be inherited from the parent Group. 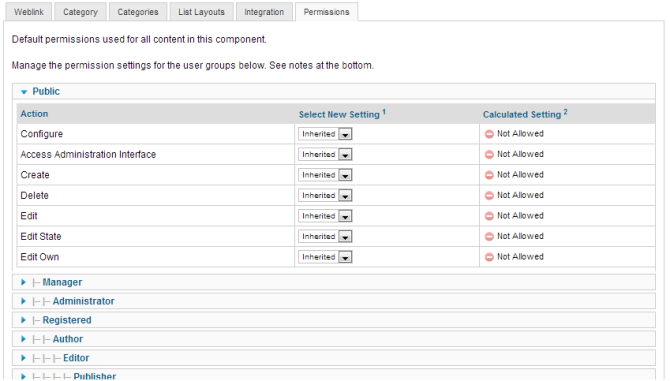 The second is to see how you can control the default permissions by Group and by Action. This provides a lot of flexibility. For example, if you wanted Shop Suppliers to be able to have the ability to create an article about their product, you could just change their Create value to "Allowed". If you wanted to not allow members of Administrator group to delete objects or change their state, you would change their permissions in these columns to Inherited (or Denied). It is also important to understand that the ability to have child groups is completely optional. It allows you to save some time when setting up new groups. However, if you like, you can set up all groups to have Public as the parent and not inherit any permissions from a parent group. You need to add at least one Category for Web Links before you can add your first Web Link. Categories are added using the Web Link Category Manager. You might also wish to let visitors submit new Web Links. To do so, simply add a Submit a Web Link menu item to one of your menus. One way of displaying links on your site is to use the Weblinks module to list links from a specific category. Another method is to create a menu item of type Weblinks - List All Web Link Categories or Weblinks - List Web Links in a Category to have a page display all Web Links categories, or all links within one Web Links category. To add or edit Web Links: Web Link Manager - New/Edit. To work with Web Links Categories: Web Link Category Manager. Web Links-related menu items: List All Web Link Categories, List Web Links in a Category, Submit a Web Link. This page was last modified on 18 April 2013, at 13:22.